The ultimate competitor in the tropical rainforest! Stranger Fig is a common name for a number of species of Ficus trees (family Moraceae) that exhibit a unique adaptation for growth and survival, using a support or host tree to establish itself and eventually outcompete for resources. Some banyans (also Ficus spp.) and vines employ this “strangling” behavior. “Matapalo” means “tree killer” in Spanish, and is a well-known type of tree across its distribution throughout the tropical regions of the world. Here’s how it happens: a bird, bat or monkey deposits a seed in the canopy of a large tree. The seed has a sticky coating, allowing it to attach well to a crook or crevice on a branch. From here, the germinated seed begins to grow roots and extends them down rapidly to the forest floor. These hemiepiphytic beginnings allow the strangler fig to establish itself quickly in the ground and take up nutrients rapidly for fast growth. At the same time, the seed begins to send branches up into the canopy of the support tree, producing leaves and beginning to produce its own food by the process of photosynthesis. The older host tree offers the aggressive fig a surface to support itself, and as it grows, the strangler wraps and thickens its roots around the trunk of the tree. As it gets bigger and bigger, the strangler roots can actually cut off the circulation of the xylem and phloem in the bark of the support tree. Up at canopy level, the emerging dense crown of leaves shades the support tree from the sun, cutting off its ability to effectively photosynthesize. Furthermore, the root system of the strangler outcompetes the support tree’s system below at ground level, taking up more nutrients and leaving few behind. Eventually, the support tree may die. The strangler fig is not truly parasitic, as it uptakes nutrients from the ground and produces its own food via photosynthesis. Whether the support tree dies due to being outcompeted by the strangler fig, or if it dies of old age, the trunk often rots out. By this time, the younger strangler fig is well-established with thick roots forming a trunk and can be self-supporting, leaving a hollow core where the support tree once stood. Strangler figs can grow to be huge forest giants – up to 40 meters tall and 20 meters wide, or more. The largest species is found in India, and one specimen covers 4 acres! The strangler fig is an incredibly important component of tropical and subtropical forests. Even though it causes the death of another tree, it is considered a “keystone species” as it provides a niche habitat for many animals to live in its multitude of crevices in the roots and trunk. 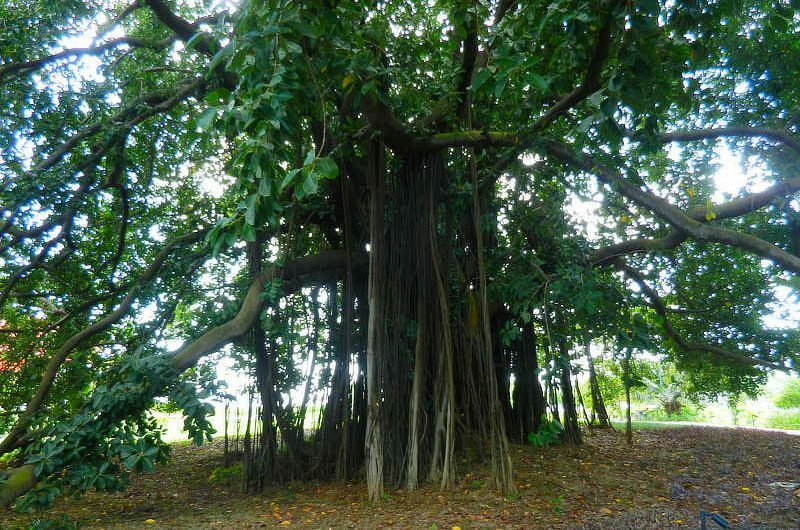 Ficus trees are also known for providing an excellent food source to many animals – birds, bats, monkeys, reptiles, even insects feed on the figs produced by strangler figs. They also produce fruits up to several times a year, and often are the only food source available during certain periods when no other fruit is available; thus the survival of many species depends on the strangler fig. Strangler figs are easily recognizable by their entwining roots, but also have light-colored bark, a large umbrella-shaped crown, and thick, oval-shaped, waxy leaves to protect the tree from water loss through transpiration. Fruits (figs) are round with a fleshy center full of small seeds. Figs for human consumption are the fruits of F. carica, an Asian species. Ficus trees are pollinated by fig wasps, highly specialized wasps from the family Agaonidae. They have a complex, mutualistic relationship with the trees. Click here for a more detailed description of the reproductive cycle of fig wasps and how they pollinate the trees. The genus Ficus contains approximately 900 species; not all exhibit the strangling growth strategy of the strangler figs. They are common throughout the tropics, and in Panama, 17 species of native Ficus trees can be found on Barro Colorado Island (in Gatun Lake) alone! One of the more notable stranglers in Panama is F. obtusifolia.